Photo taken by my mum, via Skype. She is sneaky like that. Kids really do say the darndest things. Why, it was only this morning that I was burying my head in my hands as my 21-month old son repeated "oh shoot, oh shoot, oh shoot" over and over again. Other Espen classics have lately included "Mama, draw poopy?" and a suggestion that his Daddy should sleep outside. The things that come out of his mouth vary from giggle-inducing, to stupefying (Did he just say...?) to outright mortifying. I was putting Espen down for his nap after a very wild and raucous diaper change. He was squirmy and wiggly and I was thinking to myself that this nap is just not going to take (it still hasn't). After getting him settled in with his crazy cat, two giraffes, a hippo and a blanket, I stroked his face and told him good night. 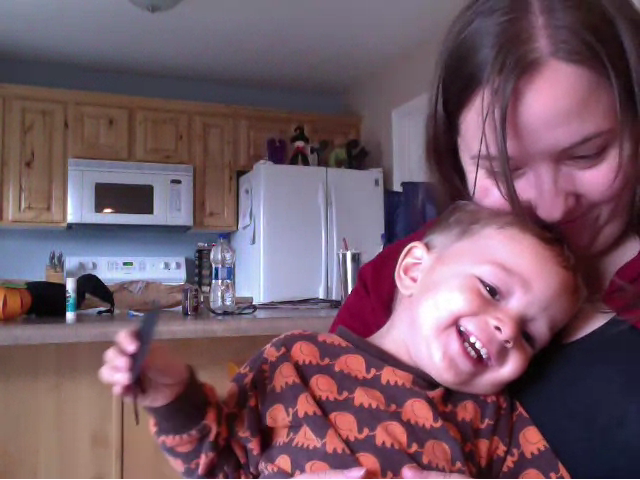 That was when Espen looked up at me said said : "Mama, I love you." He has never said that before. Granted, he's not even two yet, so it's not too surprising, but this is also a little boy whose vocabulary includes words like "hexagon", "ambulance" and "sculpture". We tell him that we love him all the time, so it's a phrase he's heard, and as his mother, I know it's an emotion he feels. Today was just the day he decided to put the two together, and I am so grateful I was there for it. So grateful to feel the impact of having those words meant for me. So grateful to know that, together, we are doing something right. So sweet! I can only imagine. What a gift! åååå, for et utrolig søtt innlegg!! Those are the sweetest words a child can say to a Mom. He is sooo cute!